David Mixner returns with his first book in 10 years. 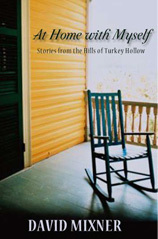 In At Home with Myself, Mixner writes from and about his country home in Turkey Hollow, an upstate New York town so small and remote that it has just 10 residents, there’s no cable TV, the nearest airport is a three hour drive, and deer and bear are his closest neighbors. However, these bucolic surroundings provide an ideal setting for observation and reflection. Drawing on his considerable talents as a storyteller in the tradition of Garrison Keillor and Will Rogers, Mixner chronicles his return to nature at the age of 60. No longer willing to do the things young people do and having lost most of his closet friends to AIDS, he felt out of place in the big cities and “gay mecccas” that had been his home all his adult life. So he chose a mountainside home as a retreat from the busy world, a place of meditation on the small, daily wonders of pastoral life, including the beauty of nature and its constant evolution.